10:30 am. Gentle movements to promote balance, flexibility, mobility, stability and strength. Combines Dance Arts, Healing Arts and Martial Arts techniques. Good for all fitness levers. We will go through basic yoga movements and postures designed to increase strength, balance, and coordination, and have a good time doing it. Suggestions will be offered for exercises you can do on your own and integrate into your daily routines. Join us for a French discussion group. We will meet every two weeks. Have a project that needs organizing? and need help to keep at it? A group for those of us who want to get on top of an organizing project or two, and would like the support and encouragement of others to get into action. Join us this month at JOHNNY MACK‘S, 1114 8th Ave, between 11-12 Streets! Walk for 1 hour in or around Prospect Park. Meet at corner of Grand Army Plaza and Prospect Park West at 8:30 a.m.
Join us for an afternoon of Scrabble from 2:00. All levels welcome. GNPS artists will have shows every 6 weeks on the balcony over the bar at Nitehawk. No movie ticket is needed to see the show: elevator to Mezzanine level, then up steps to balcony show. Current show: April 18th-May 28th. Reception May 1st, 6-8 PM. 7th Ave in Park Slope; Exact location will be sent in registration confirmation email. Sleep a little later and then join us for a breakfast and good conversation at 9:00 AM! 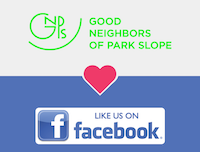 meetup with Park Slope Parents and GNPS for a Spanish speaking event!